Early next year, Lower Merion Township will be initiating a demonstration Bike Parking Project in front of the Sporting Club in Ardmore. This project entails the adaptation of the existing bollards into ‘hitching posts’ suitable for bike parking. This will allow bikes to lean against the bollards and since the bikes can be parked parallel to the sidewalk, they won’t conflict with pedestrian traffic. 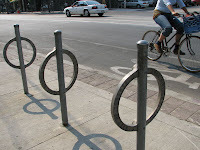 The converted post and ring racks are modeled after the citywide program in Toronto. Lower Merion Planner Chris Leswing reported that the Township's narrow sidewalks made it difficult to accommodate the traditional inverted U bike racks.